Anyway, enough of that, lets get onto today's card. It's challenge time over at Winter Wonderland and this week the theme is 'It's a Beary Christmas..' The winner receives a 12 pound voucher from Crafty Sentiments. Obviously I had to use the cutest bear ever...Mr James. 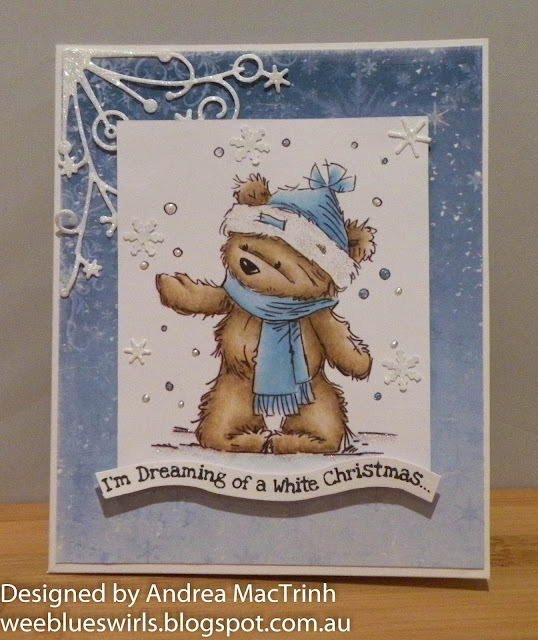 I absolutely love LOTV James the Bear and own alot of christmas stamps featuring him! Today's card however was actually made with a pre-coloured die-cut and I keep it super simple! I added some glitter, pearl drops and snowflake die-cuts and mounted it onto some gorgeous paper. The sentiment is also from LOTV.